What Would Cole Be If He Were an Olympian? Cole and Heidi Hamels stopped by NBC10’s The 10! Show to talk about the work the Hamels Foundation is doing to help education in inner-city schools and beyond and of course to talk about the $144-million deal that keeps Cole with the Phillies for the next six years. We will get to those things in an exclusive web interview the Hamelses gave to NBC10.com, but first thing’s first -- what Olympic sport would the Hamelses play? Cole says beach volleyball is another possibility since he grew up playing those sports in Southern California. Phillies royalty Cole and Heidi Hamels share details on their latest victory, their growing family and life after signing a new deal. You can donate to the Hamels Foundation by texting HAMELS to 20222. For more information on The Hamels Foundation go to thehamelsfoundation.org. “I have a college scholarship for track and field and he says… synchronized swimming?” Heidi questioned Cole. Phillies royalty Cole and Heidi Hamels share details on their latest victory, their growing family and life after signing a new deal. You can donate to the Hamels Foundation by texting HAMELS to 20222. We’re putting the power couple to the test with a surprise trivia game. 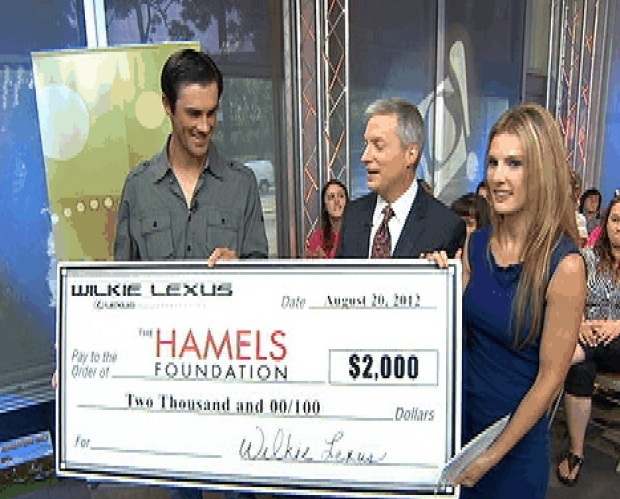 For more information on The Hamels Foundation go to thehamelsfoundation.org. “She can run circles around me,” Cole said. Circles for sure considering at Drury University Heidi says she ran the 800m, 1600m and even marathon-distance runs. But one thing Cole certainly is skilled at is baseball and it’s on the mound where he consistently takes his turn every five days. Since 2008 Cole has started at least 32 games a season for the Phightins. So what’s his secret to success? “Be true to thyself,” is the family motto says Heidi but Cole is driven by more than just that. He has a self-driven desire to be the best. “My secret is that I never stop. I’m always doing something. I think that some people feel like they need a break… I don’t know where they get that sort of information where they deserve a break, they deserve to take the time off. Because there is always going to be someone to do more that is going to outwork you. “I would rather be that person that outworks everyone or outworks myself. I put the goals and compete against myself. I think that’s what it is, I’m accountable. If I miss something and I didn’t do it well I know about it and I’m gonna make up for it. Cole and Heidi grew up in public school systems and they hope that their work with their foundation, which they founded in 2008, helps give kids the chance to make it happen. “We grew up just like everyone of these people going to a public school and going through the process of daily life,” Cole said. “Except for then I became this baseball player and obviously people look at you at a different level. “We really do care and we really do want to be involved as much as we can,” Cole said. Check back Tuesday for the continuation of our exclusive web interview with the Hamelses as they talk about the joys of parenting and if Cole will be picking up a South Philly accent since he is here to stay after signing the biggest deal in Philly sports history.